Welcome to Day 4 of Soup Week! I'm sharing a different bowl of soup with you every day this week. Enjoy! I had mixed feelings about whether to share this soup with you because, honestly, I wasn't a huge fan. But I do learn just as much about cooking and my palate when I don't like a recipe as when I feel that a dish is a success, so here it is. 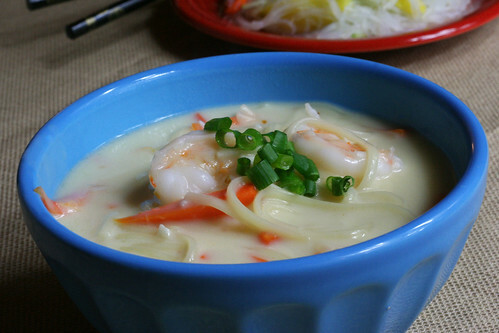 Martha Stewart's Coconut Shrimp Soup. There's a good chance that I didn't like this because I'm such a huge fan of authentic Tom Kha, Thai Coconut Soup. It's one of my favorite comfort foods. In retrospect, it was silly of me to expect this soup, found in a cookbook designed for quick and easy weeknight meals, to even slightly resemble the real thing. My main issues with the soup were that it tasted like watered down coconut milk and that the carrots took up far too much of my time. In all fairness, though, I do need to work on my knife skills! When you think of this soup doing its own thing, instead of trying to pass itself off as Tom Kha, it might not be so bad. 1. Heat the oil in a large saucepan over medium-low heat. Add the ginger, garlic, and the pepper flakes; cook, stirring, until fragrant, about 1 minute. Add the carrots, coconut milk, and 3 cups of water. In a small bowl, mix the cornstarch and 2 tablespoons of water until smooth; add to the pot. Bring to a boil. 2. Break the pasta in half; add to the pot. Return to a boil, reduce the heat to medium, and simmer until the pasta is al dente and the carrots are just tender, 3-4 minutes. 3. Add the shrimp; stir until opaque, about 1 minute. Remove the pot from the heat and stir in the lime juice; season with salt. Ladle into serving bowls and garnish with the scallions. Serve immediately. I made it as well. I thought it was okay. Not spectacular, but good for a quick dinner. I thought there was too much carrot for the soup. Another thing I did was cook the prawn shells with the liquid for a bit to add more flavor to the soup base. Then I used a spider mesh to fish out all the shells. I used the shells from the shrimp that I peeled.